X Bat hats are the finest FlexFit hats on the market today. They come in tone on tone Black with a Black X Bat logo, White with a White X Bat logo, Grey with a Grey X Bat Logo and Navy with a Navy X Bat logo. They are available in S/M Fitted (6 7/8" - 7 1/4") and L/XL (7 1/4" - 7 5/8"). A great look both on and off the field. 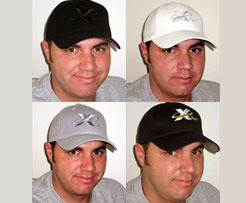 X Bat 50/50 hats are the finest FlexFit hats on the market today.